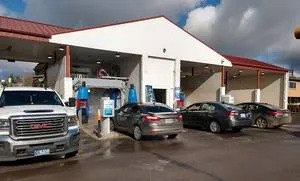 Investors bought Spray N Shine Car Wash in Dallas, OR in January 2018. At that time, it had an AUTEC AES-425 Soft Touch in-bay automatic car wash alongside five self-service bays. The original machine was installed in 2012 and has washed 135,000 vehicles. Because they sometimes had to wait in line, customers suggested that the new owners add a second automatic. A second AUTEC Soft Touch System was installed right beside the first one. With both machines operating, Spray N Shine can wash a car every two and a half minutes, keeping customer waiting time to a minimum. Even though the older AUTEC is seven years old, it still runs in top-performing fashion. The new owners report that prior to the addition of the second in-bay automatic, the typical number of vehicles washed daily at the location was in the 130s to 140s. Since the new wash came on board, the numbers are in the 220's to 240's. The conclusion: the wash was previously losing about 100 vehicles per day in good weather. The wash now features two in-bay automatics.